Indonesia's Geological Agency said it has yet to collect adequate data to determine whether the eruptions of the Anak Krakatau volcano caused, or partly caused, the high waves on Saturday night that crashed into houses and other buildings in the coastal areas in the western tip of Java and southern tip of Sumatra. Indonesia's disaster management agency BNPB said the tsunami was caused by "an undersea landslide resulting from volcanic activity on Anak Krakatau", and was exacerbated by an abnormally high tide because of the current full moon. 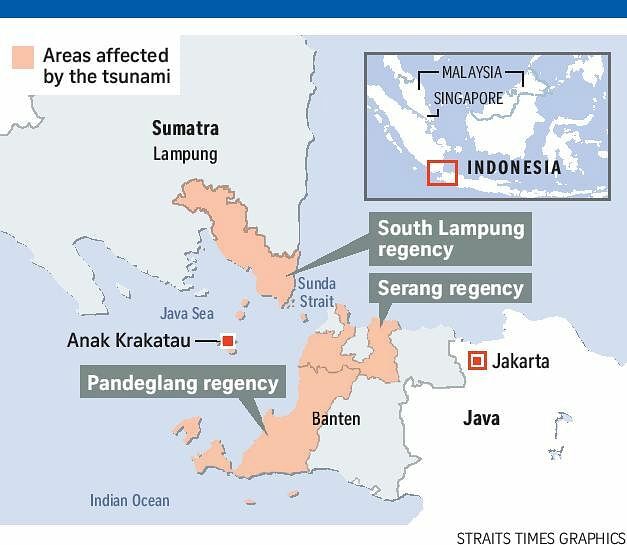 Indonesian Tsunami Expert Association chairman Gegar Prasetya said that based on the meteorological data, there was no earthquake or storm on Saturday and, therefore, the tsunami was linked to the activities of Mount Anak Krakatau in the Sunda Strait. He further said that such a tsunami might have occurred in the past as part of the formation process of Anak Krakatau, but the incident was unmonitored and no casualties were recorded, as local people did not erect buildings close to the seashore. Going forward, the Meteorology, Climatology and Geophysics Agency must enhance its early warning system by covering phenomena other than tectonic earthquakes, Dr Gegar added. But the head of Indonesia's Geological Agency, Mr Rudi Suhendar, said that such high waves might not be related to Anak Krakatau's volcanic activity. "From a volcanology point of view, such chances are small," Mr Rudi told The Straits Times by telephone. "Anak Krakatau's eruption yesterday measured at amplitude 58 and an eruption of such measurement did not happen only (on Saturday)," he said, adding that Anak Krakatau has been acting up since end-June. Anak Krakatau, or Child of Krakatau, emerged in the Sunda Strait around 1928 from the caldera, or huge hollow, formed by the Krakatau volcano after its massive eruptions in 1883. "Its perfect conical shape today is owing to this gradual development," he added, stressing that Saturday night's tsunami could be attributed solely to bad weather. "There are two schools of thought currently regarding Saturday night." Mr Rudi's agency is waiting out the bad weather in the area, which is currently also marked by pouring rain, to carry out further assessment to determine what caused the calamity. "The weather is not favourable now, our team cannot get good visuals," he said.